I’m wandering into unknown territory here. An aperture between my attempt to create new content which is different to what I’ve dabbled in before but also content which is reminiscent of the writing I’ve always favoured. You see, 2018 seemed to resemble what can only be described as a tug of war between two halves of myself. One part of me wanted my website to become this dynamic, young & hip (I jest slightly) magazine like space on the web which people flocked to (ambitious) for friendly advice and chit-chat. The other part of me wanted to nurture the budding writer inside myself which had been suppressed for so long. To write compelling yet relatable content. I’ve always enjoyed writing however I’ve been caught up in the chaos of the modern world *read instagram* recently and writing eloquently was no longer a trait I seemed to focus on. I busied myself so much with trying to figure out what content people would be most interested in that time seemed to trickle away like the last touches of warmth as summer left us. Overall 2018 was a successful year in so many ways but I also felt like I wasted a lot of time. Fueled with ambition from some of the success I had in 2018 I am determined to make 2019 a year full of purpose, yet balance it with as much time out as possible too. And in this vain, I hope these life elements will in turn help me to create the content I’ve been so desperately searching for. In 2018 I spent a lot of time focusing on Instagram, and whilst I don’t regret feeding a lot of time to the beast that rarely gives back it did take up large periods of my day. I don’t regret lending that time as my Instagram grew more into it’s own but I am also very conscious that Instagram probably has a limited lifespan. Like the leftover Christmas cheese sitting on my fridge top shelf, I often wonder when the expiration date on this app will arrive. I know it has plenty of time left in it, but, how much time are we actually talking. I wonder when will the platform fall to the wayside similar to previous social media relatives. Will it’s time come to an end eventually and those minutes which seeped into hours spent worrying over how many likes you got on a photo all feel for nothing? In 2019 I want to spend my time wisely. Invest my time into living more. Forget about the minor inconveniences of the Instagram app and be more shrewd with where I spend these sacred minutes which make up our time. It turns out that in 2018 I discovered that I missed how it felt to be relaxed. To take those quiet moments to yourself, nested at home enjoying your favourite TV show with an array of snacks scattered across the sofa and yourself. To not have to-do lists impeding on a tranquility you’re trying to create where you’d just like to pick up a good book and cradle a warm cup of tea between your fingers and palm. I am yearning for these moments back in my life as time has seemed to recently dictate that these sacred moments are no longer often possible. So this year starts much like many years that have proceeded before it, with a vow to take time off. More evenings spent at an angle of 180° with Netflix true crime documentaries on repeat. Sundays spent lazily strolling along the Suffolk coastal shores. Rushing home after work on Wednesdays to catch the early evening viewing of a film at the cinema, rushing because I don’t want to see a later viewing as it’s a strict bed by ten on a work night in the Ellis/Todd household. These small favoured activities which distract us from the hectic state of working life can be so welcoming and almost act like a sigh of relief as you shrug off the weight of the day you left behind. I hope to start practicing more methods of timekeeping, organisation and relaxation. Perhaps meditation is on the cards, though not totally sure about that one as my brain is pretty much like a 3 year old toddler which simply can not sit still. Or more running and swimming in an attempt to drive more focus from my brain onto things which do not revolve around small mobile devices. I’m not totally sure yet what I will do over the course of 2019 to encourage more time out in my life but I will make sure to try and share with you all. February was a manic month for me and it’s given me a bug to go out and do MORE. With trips to Brighton, Belfast and Lisbon spanning over three weekends, though I was very much looking forward to having some time soaking in the comforts of home I had been doing my best to get out and enjoy the chaos of life. I’ve often found city breaks enjoyable as I seek pleasure in the ease and effortless of it all. I enjoy the aspects of a short flight, light luggage, and the smaller expense of only being there for a few days. I love my long holidays away but they do tend to burn a bit of a hole in the pocket sometimes. In December Ollie and I visited Prague to see one of my very best friends and the whole affair was cheap & cheerful with the airbnb only pricing up to be around £150 for 4 nights and spending money was £100 each. Therefore the money savvy mogul in me hopes for more weekends away in European cities this year as it’s great to soak in the culture but not have to spend a small fortune. I am becoming increasingly aware of the detrimental affects that fast fashion is having upon the environment and it weighs heavy on my mind knowing I work in a position which allows me to learn and make potential change within my choices and my followers choices too. Since watching Stacey Dooley’s documentary last year on Fashion’s Dirty Secrets I have made an effort to cut back on buying from fast fashion retailers. It’s not a ground breaking change I know, but I am proud of the amount I no longer online shop. I admittedly do still shop in places like H&M and Topshop but not as often now and I’ve made a real conscious effort to recycle my old clothes. Over the past couple of months I have cleared 8 bin bags from my Wardrobe and given them to friends/charity and recycling centers. 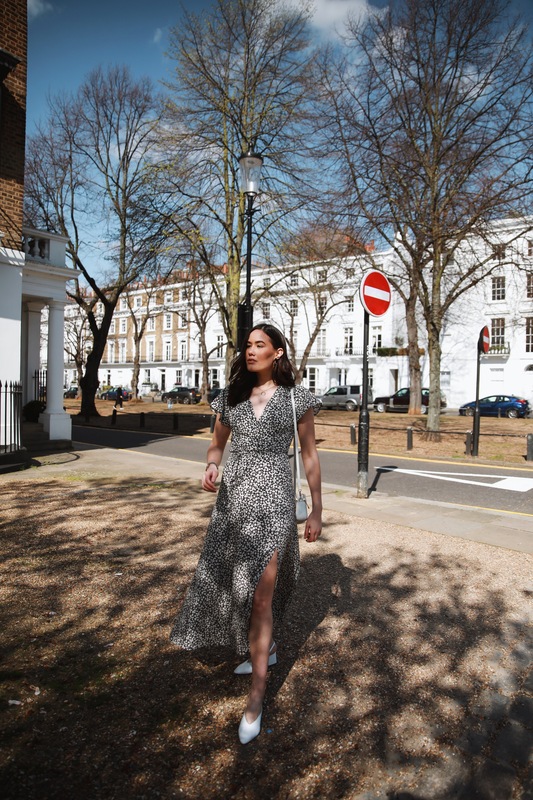 I’ve also made more of a conscious effort to only now spend my money on investment pieces for my wardrobe, items which I will love and wear time & time again. For instance a comfortable white tee can be worn in multiple ways in many different styles and a good quality one will last. There is so much more I can do, and so much more I can talk about through my platform to help others understand the effects of fast fashion and the benefits of sustainable fashion. Hopefully this will be something I can vastly develop within myself over the course of 2019. I’m not sure if it’s something to do with Mercury being in Retrograde or whatever, but March definitely started off on the wrong foot for me. A series of unfortunate events seemed to unfold in the opening days and though I won’t divulge too much, these testing times seemed to put me in a negative space where I viewed everything with a much less positive spin. This negative energy started seeping into everyday aspects of my life and began affecting things like how I felt about the content I was putting out on Instagram. In turn I felt my engagement slowly start to drop off, my followers grew stagnant and I became rather disinterested in the whole affair. I was in a rut. I stayed in this rut for about two weeks which is when I realised I needed to make some changes to get my old upbeat self back on track. I made a huge mood-board of content which gave me inspiration for the type of content I would like to create myself. I made lists of places I would like to go to shoot my outfits. I spent hours scrutinizing my editing techniques and adjusting them so that I could get my images to the highest and sharpest quality possible. These changes gave me a drive I had been lacking and eventually the time I was spending on Instagram became more enjoyable again. The more positive I began to feel the more things began to pick up. My engagement started to level out again and exciting work opportunities began landing in my inbox. I was slowly getting back my old positive outlook. Being positive isn’t the magic answer to all problems in life, but I found it fascinating that changing my energy from negative to positive had made such distinguished differences. So 2019 is definitely going to be a year of putting as much positive energy into everything around me as possible. "Hitting Winter in my Favourite New Coat"